In early July 2014, Burn Magazine asked me to take over their Instagram handle to share images and stories as I was reporting in Ukraine. The exercise was enlightening: how do you share an intense and complicated story in snippets (with character limits) over seven days? I loved being able to shape a long form story around vignettes that were brief enough to engage a casual viewer, but detailed enough to provide insight into what the mainstream media isn’t covering in the Ukrainian crisis. The users learned new information along with me; they met the characters and saw the places in real time. Below is the second of the two main pieces I produced for them, a glimpse into the mobilization of civilians to fight for the Ukrainian Army. To see the photos on Instagram in their original format click through to this Storify, and select the individual images. Read the other story, about the encampment on the Maidan, here. Though you wouldn’t know it from what I’ve been posting here, I actually didn’t go to Ukraine to write about the men parked on the Maidan not fighting the pro-Russian separatists in the east — but about those who ARE fighting. And while most of my journalist colleagues were suiting up in kevlar and shipping out to Donetsk to embed with the stoic boys sporting RPG-launchers, I hopped on a marshrutka and headed all the way west, to follow a different lead. On April 11th, I got a panicked email from my best friend who lives in Chernigov. Her husband, who is from Lutsk, in western Ukraine, had received a phone call in the middle of the night, telling him to report to the nearby military base two days later. Though he had already served his mandatory time in the army in 2007, he was being mobilized to help with the current situation. He called his twin brother with the news, and discovered that he, too, had gotten a call. I tried to reassure my friend that it must be a mistake: her husband had already served, was older than the draft age, and had a young family to support — surely it was just a mixup. But it wasn’t. Within the next week, six more of our friends or acquaintances from the western part of the country got called up in the mobilization. 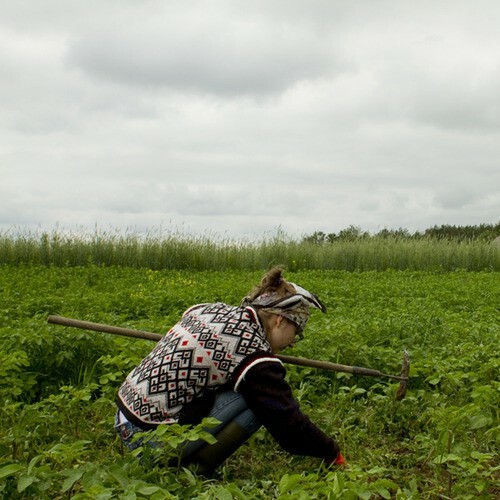 Once I got to Ukraine, I headed west, to the small farming communities in the Volyn Oblast on the Belarusian boarder, to find out what was going on. It’s #throwbackThursday, and so I wanted to post a photo of my dear friend from a happier time together, two years ago, when we spent a summer digging in her family’s garden, swimming in the canals, and teaching her baby girl her first words. We raced a summer thunderstorm out of Kyiv and rode six hours in a packed minibus to Rivne, to see my friend’s sister-in-law who is pregnant with her first child. We left that night for the fields. My friend’s in-laws live in a two room farmhouse in a tiny hamlet 25 miles outside of Lutsk. It’s NatGeo country to the max: babushki in headscarves hauling water, young men cutting tall grasses with scythes. A horse cart came to collect us about halfway through the five-mile walk in from the road. My friend’s mother-in-law said she’d heard about my story, and could help me talk to affected families in their hamlet, but we had work to do first. She handed us canvas gloves, and we headed out to the potato field to get some weeding done. 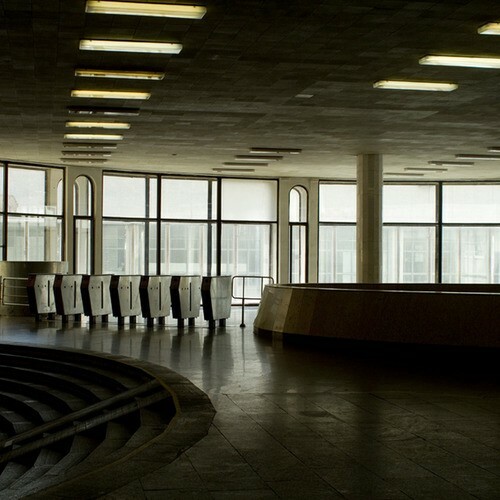 The meeting hall at the municipal building in Koval, Ukraine. 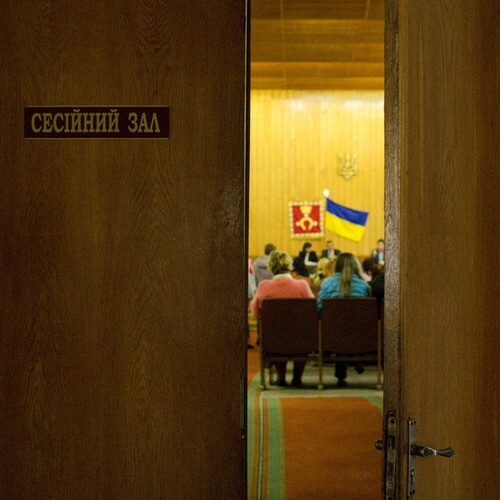 I was sitting in a wood-paneled meeting hall in the municipal building of Koval, in Western Ukraine, watching as more than 200 wives and mothers of men who had mobilized had it out in an open-mic shouting match with their local MP, Stepan Ivakhiv. A well-built man in an elegantly cut suit, with an open face and slide-rule sharp part, Ivakhiv is a gasoline and dairy magnate who spun the oligarch wheel in the 1990s and came out on top. He’s a man worth over $200 million representing a region where it’s not uncommon to earn a salary of $200 a month. It was bold of him to agree to the meeting, and he was taking the verbal beating with more grace than I would have expected. He fielded questions from the stage, seated behind a great oak podium, with three other local officials and a member of the military, while the crowd teemed below him, jostling one another to get to the microphone. This much became clear, very quickly: several hundred men from Koval and the surrounding area had been called up in the mobilization. They’d been told they’d serve for 10 days, preparing equipment in nearby Rivne, and be sent home. Then it was extended to 45 days, and families started losing touch with the men very suddenly — only to find out they’d been sent to the Donbas to fight. For most, the 45 days had come and gone weeks before. Military ‘salary’ was not being paid. Men were living in abhorrent conditions. Ivakhiv had little by way of an answer for it. A young blonde with overlarge blue eyes and long acrylic nails got up: “He was in Donetsk for three weeks, and I didn’t hear a word. My little girl cried all night, ‘Tata! Tata!’ [daddy]. When I heard from him next, he said they’d only been given a liter of water to drink each day…it was over 30 degrees!” She burst into tears and begged for Ivakhiv to send her husband home. 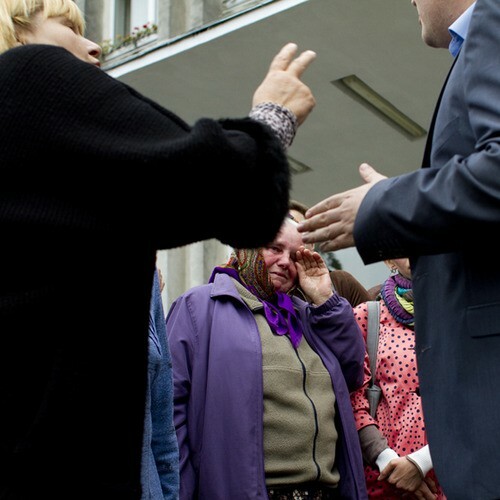 Ivakhiv looked genuinely pained, and at a complete loss. “I am so sorry,” was all he could manage. The women at the meeting were primarily poor, and relied on their husbands or sons to provide a substantial part of their livelihood. The hysteria was more anxiety than grief: nearly all the women attested to their loved one’s patriotism, his willingness to serve, but a prolonged absence could literally ruin a family. Military salaries weren’t being paid, and though technically illegal, many employers were not holding jobs for those who had been called up. Many of the men who weren’t in the east fighting were left sitting on military bases nearby, going through training exercises or equipment checks, but not contributing directly to the cause. 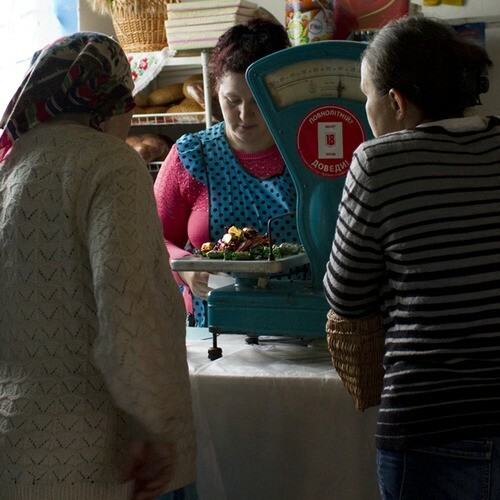 Irina weighs out candy on an old soviet-era scale in her grocery store. For $80 a month, Irina spends six days a week working at the tiny grocer that provides my friends’ hamlet with everything from toilet paper to chocolate to funeral wreaths. A mother of six with a broad smile and a chatty manner, she weighed out candy for me and told me about her oldest son, who had been called up in the mobilization. Freedom is a complicated thing — hard fought and messy, with unimaginable personal tragedies that get swallowed in the broader narrative. My father was shot in the head in Vietnam, fighting for something he didn’t believe in; both my grandfathers fought in WWII for something they did; my maternal ancestors walked nearly 1500 miles across the American plains in search of a place to practice their religion freely. We are all seeking freedom from something: oppression, addiction, loneliness, poverty, ignorance, disease, heartache, fear. On this 4th of July holiday, it is my sincerest prayer that we all might find the freedom we seek. Zoloti Varoti metro station in Kyiv. One of the most bizarre parts of reporting from a conflict zone is observing the ways in which life keeps moving despite everything else. People go to work, to school. They have weddings and graduation ceremonies. They buy groceries as if it were a regular Tuesday because wars or revolutions don’t exempt you from needing milk and eggs. Coming back to Kyiv, I felt that keenly. I had grown so wrapped up in the stories of the people I was interviewing out west that it almost felt like a betrayal to go out to eat with friends, to have a good time. Yet that’s exactly what is needed most in times like this. A little levity can be a powerful weapon against fear and despair.